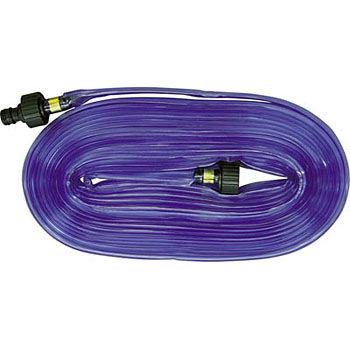 Connector (sold separately) is required to connect to the hose. Watering the garden and striking the entrance. Maybe snow melting as well. Convenient. There is also considerable durability. In the case of plants that do not want water to hang, I turn it inside out. It is more freely bent than the soaker hose, and it is easy to use as it is freely changeable. If attached with a line on the back side, it is convenient to distinguish it from the table immediately. Unhappy points require a connector for installation. It is troublesome as it has to buy it additionally. I think that the product of Takagi is wonderful in durability. There is almost no water leak. I have never used this sprinkling tube because of snow melting in winter, but I thought about using it this time and I bought it extra. This review is about item#37087233. I bought it for insect repellent of Takaradishi. I purchased repeat. In sprinklers, although it is circular watering, rectangular watering is possible with this tube, and it is satisfactory because it sprinkles evenly. Moreover, since it is spraying in a misty condition, it can gently irrigate on the leaf surface. I bought it for watering the lawn. Even with a small amount of water, water is discharged from fine holes in the form of mist, and it is saved to efficiently sprinkle water.